Hello, my name is Keith Lynch and I am the Vice-Chair person of People First (Scotland) and I want to tell you about the research we did with support from DRILL. Before I do that I want to tell you a little bit about People First. Our organisation is a user-led learning disabled person’s organisation. This means that all our members and all our Directors have learning disabilities. We hire the staff that support us to do the work we chose to do. The title of our research project was ‘Does it matter? Decision-making by people with learning disabilities’. Since the United Nations Convention on the Rights of Persons with Disabilities there has been a lot of attention on how people with learning disabilities make decisions. The UN Convention says that no person with a disability should have their right to make decisions taken away. We agree with this. In Scotland, more and more people with learning disabilities are having their right to make decisions taken away from them by Guardianship orders. Some of my former colleagues who were Directors on the People First Board have been put under Guardianship orders, and are no longer allowed to make decisions for themselves. The UN Committee on the Rights of Persons with Disabilities has said that Guardianships should be replaced by supported decision-making. We wanted to know more about decision-making by people with learning disabilities because we want to persuade the Scottish Government to change their laws. We also wanted to know what kind of support helps people to make their own decisions. To do the research we partnered with researchers from a company called Animate Consulting. They helped us by telling us how to do research and the different ways we could do the research. They also did most of the reading and wrote the final report for us. I was involved as a peer researcher and also sat on the steering group. The steering group met with the researchers once a month to talk about the research. We made all the big decisions that had to do with the research like coming up with the research questions, making sure we had enough people to take part, and commenting on the report draft by the researchers. As a peer researcher I was supported to facilitate focus groups of members. I also did a couple of one-to-one interviews. For me this was a great part of the research. I enjoyed meeting members that I had not met before. It was also very interesting to hear how people felt about making decisions. We found that making decisions matters very much to people with learning disabilities. Most people said that making their own decisions helped them feel confident and in control. I think it’s very important that we have been able to share the views of people with learning disabilities in our report and show what they think good support looks like. 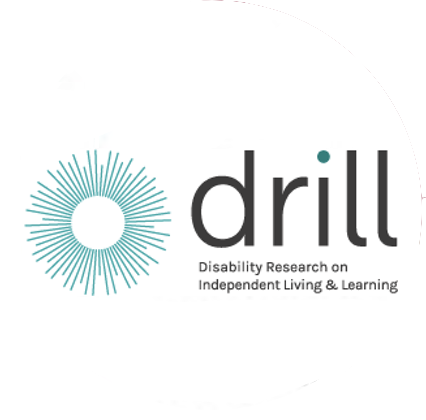 I hope you have enjoyed reading about my experience of being involved in the DRILL research. If you want to know more about the work we do you can have a look at our website www.peoplefirstscotland.org/news/. We are delighted to be the first DRILL project to publish our report. This research has been important to us for many reasons and especially because it highlights that there should be ‘nothing about us, without us’.